Click on the links below to see more information about each of our laser/light treatments. IPL improves the overall appearance of sun-damaged skin and removes age spots and freckles, most benign brown pigments, and redness caused by broken capillaries. It is an excellent treatment to help control the symptoms of rosacea. During treatment, IPL fragments unwanted pigment cells without damaging surrounding tissue. These shattered melanin particles are absorbed by the body over the following few weeks, so that little or no trace of them remains visible. Typically, the improvement is subtle and accomplished over a series of treatments so the patient’s skin does not appear obviously treated. A cold gel is applied to the area to be treated and you are given goggles to protect your eyes from the bright light. A slight sting is felt during the treatment. Post-op: A cortisone cream is applied morning and night for the next three days as well followed by your normal moisturizer over . Mild redness and swelling are normal after the treatment. Some of your brown areas may appear temporarily darker and then flake off during the following week. Fraxel is a non-invasive laser therapy to treat a broad range of skin damage, such as age spots, sun spots, wrinkles, acne marks, scars, stretch marks and other signs of aging. Fraxel treatments delivery columns of energy that penetrate the top skin layers. The laser treats only a fraction of the skin tissue at a time, leaving the surrounding tissue intact, which promotes rapid healing. This stimulates your body’s own healing process, replacing the old damaged cells with fresh glowing, healthy skin. Fraxel treatments can be used on all areas of the body like face, neck, chest, hands, arms, abdomen and legs. We use Fraxel re:store dual laser which has two wavelengths: the deep penetrating 1550 for rebuilding collagen and repairing damaged skin, and the 1927 for removing extra pigmentation. Patients typically require multiple treatments as only a portion is treated during each session. Isolaz is a light treatment that helps to clear existing acne while helping to prevent future breakouts. Isolaz combines the power of a vacuum with the proven benefits of broadband light to deliver an effective acne treatment. The vacuum applies gentle pressure on your pores helping to loosen and extract dirt, blackheads and excess oil from your pores. The second component, the Broadband light helps destroy acne causing bacteria, as well as reduce facial redness caused by acne. Isolaz is cleared by the FDA and is indicated for the treatment of mild to moderate acne, including pustular acne, comedonal acne and mild to moderate inflammatory acne (acne vulgaris) in all skin types. You may feel a small amount of pressure from the vacuum or a warm sensation during treatment, but you should not feel discomfort or pain. There may be mild redness that typically lasts less than an hour. You can go right back to your normal activities immediately post treatment. Isolaz treatment is effective on body acne (back and chest) as well as facial acne. Clear + Brilliant is a gentle laser treatment clinically proven to fight the effects aging has on skin, to give you smoother skin with a radiant, youthful glow. 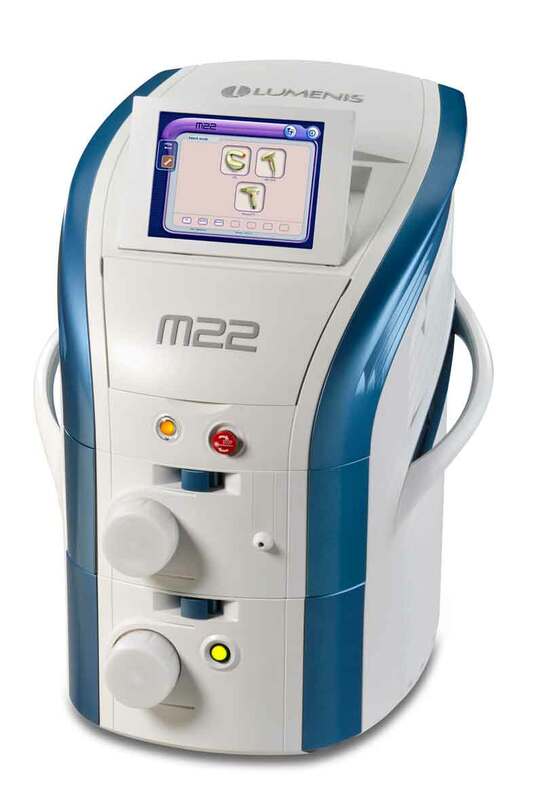 Utilizing proven proprietary fractional laser science and technology, the laser energy creates microscopic treatment zones in your skin, replacing damaged skin with healthy younger looking tissue. Multiple treatments are needed. The results can include improvement in skin texture and tone; reduction in appearance of skin pores; an illuminated skin tone; and increased smoothness and softness of the skin. Clear + Brilliant is a gentle treatment, there is minimal to no downtime, with little swelling — just some redness and a few days of a sandpaper-like texture that clears to leave behind smooth, revitalized skin. Lasers emit specific wavelengths which are absorbed by different targets in the skin, i.e melanin. The Q switched Nd:YAG is used to treat brown spots associated with aging and sun exposure. Patients will typically feel a stinging during treatment. The treated areas will develop smalls scabs that will fall off in 7-14 days depending on the body area. The underlying area may be slightly pink and fade to your normal skin color. Strict sun avoidance is necessary two weeks prior and post treatment. The Light Sheer Diode/Epilight machine targets the pigment (dark color) in hair. Areas that can be treated include upper lip, axilla, (underarms), bikini line, chin, neck and sideburns. Please allow a little hair growth for initial evaluation. Additionally, you should stop waxing two weeks prior to treatment. A test area will be done prior to treatment, to test for skin changes and efficacy. You may expect between 4-6 treatments with a minimum of 3 treatments. Treatments are spaced 1-2 months apart. Hair grows in different cycles and not all the hairs are susceptible to the laser energy (i.e., dormant hairs) in their particular growth phase. Multiple treatments are needed for cycling dormant hairs. Additionally, the skin may be temporarily lighter or darker in the treatment area during the healing period. The treatment feels like a rubber band snapping on the skin. Please shave the area one day before your treatment. The area is chilled prior to treatment. Additionally, one can apply a topical anesthetic (i.e., Emla) one hour before coming into the office. After treatment, the area may be red for 1-2 days. It is helpful to apply a mild cortisone cream to the area two times a day for three days to reduce redness. You will be given a prescription for the cream. Strict sun avoidance should be observed in the area prior to and for two weeks after. AcuPulse CO2 is a complete ablative laser that is used to resurface aged-induced skin damage, such as, uneven pigmentation, fine lines, uneven texture and acitinic keratosis. It can be also used to treat and revise deeper lines and wrinkles, acne scars, uneven texture, and more. The AcuPulse laser offers unique SuperPulse technology and continuous wave capabilities. Patients should allow one week of downtime.